The Outsider Art Fair is coming to New York on January 29, bringing 50 international galleries of folk, self-taught, and outsider art to Center 548 for four glorious days. The fair offers the rare opportunity for artists operating far outside the regulations of the art world -- whether marginalized, isolated, incarcerated, institutionalized or psychologically compromised -- a space to show the vibrant and singular artworks that don't just reflect their worlds, but constitute them. In anticipation of one of our favorite art events of the year, we're spotlighting a different outsider artist every day. Paul Laffoley was born in Cambridge, Massachusetts in 1940. His father was a lawyer, his mother a strict Roman Catholic. He has a degree from Brown and another from Harvard. With such an intellectual upbringing and prestigious education, among outsider artists, Laffoley's an outsider. Actually, in comparison to others, Laffoley is almost another beast entirely. His transdisciplinary canvases appear to be the product of a computer, despite the fact that their entirely handmade using ink, paint and stick-on letters. The multicolored mandala-inspired works, land somewhere between a mystical altar and a conspiracy theory pamphlet. Laffoley, a student of classical literature and architectural studies, channeled his thirst for knowledge into paint, crafting infinitely complex diagrams that weave together aspects of philosophy, science, architecture and spirituality with dizzying flat maps of image and text. After graduating from college Laffoley moved to New York, to work as a studio assistant to architect Frederick Kiesler, known for his Endless Theatre design. He was also recruited by Pop visionary Andy Warhol to watch a stream of televisions set up in Warhol's Harlem studio, from 2 a.m. until dawn. He then spent 18 months working with architect Minoru Yamasaki on designing the World Trade Center towers. In 1965 Laffoley finished his first painting, made in his parents' basement. It was titled "The Kali-Yuga: The End of the Universe at 424826 A.D. (The Cosmos Falls into the Chaos as the Shakti Ouroboros Leads to the Elimination of all Value Systems by Spectrum Analysis)." The piece took on the (mighty ambitious) task of illustrating the end of the universe. As you may have ascertained from the title, Laffoley's paintings are not easy to digest. Each took the artist approximately a year to complete. As for the viewers, they need even more time on their hands. 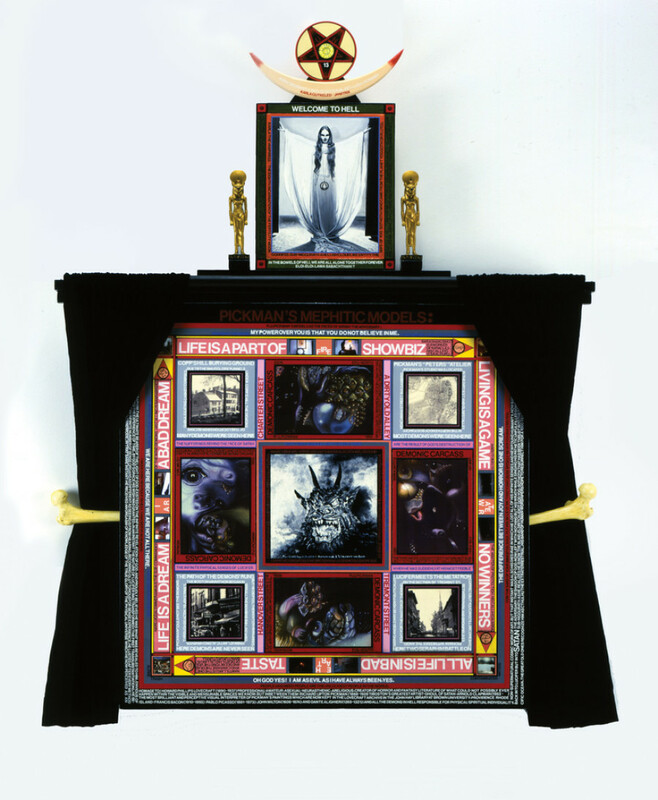 "People who have bought my work say the usual time it takes to comprehend it is 15 years," Laffoley told Wonderland Magazine. Although 15 years sounds like an awfully long time, it's a necessary chunk to understand the cavernous and convoluted content going into Laffoley's kaleidoscopic works. There's extraterrestrial activity, Daiun Sōgaku Harada, time travel, William Blake, alchemy, relativity, Socrates, lucid dreaming, astrology, Buckminster Fuller, questions of the 4th or 5th dimension, and references to sci-fi films including "The Day the Earth Stood Still" -- which, in case you were wondering, he's seen over 870 times. 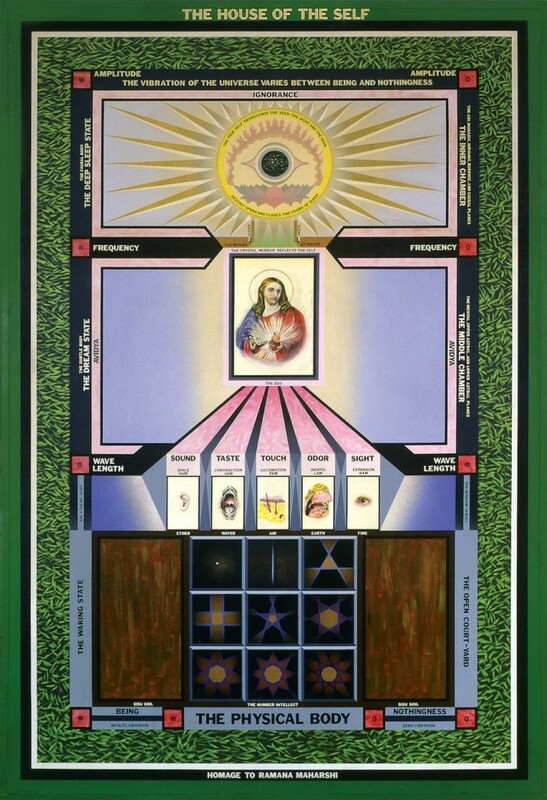 Throughout a majority of his works, Laffoley has worked towards a singular concept of "utopic space" -- described as "a realization of a transdisciplinary worldview capable of sustaining human existence into a continuous future." In Laffoley's own words: "My work is the product of the convergence of the instantaneous practice of invention and the slow craft of art. I have always believed that my period of most complete expression and appreciation would be my late future and, beyond, in 'time phase X.'" 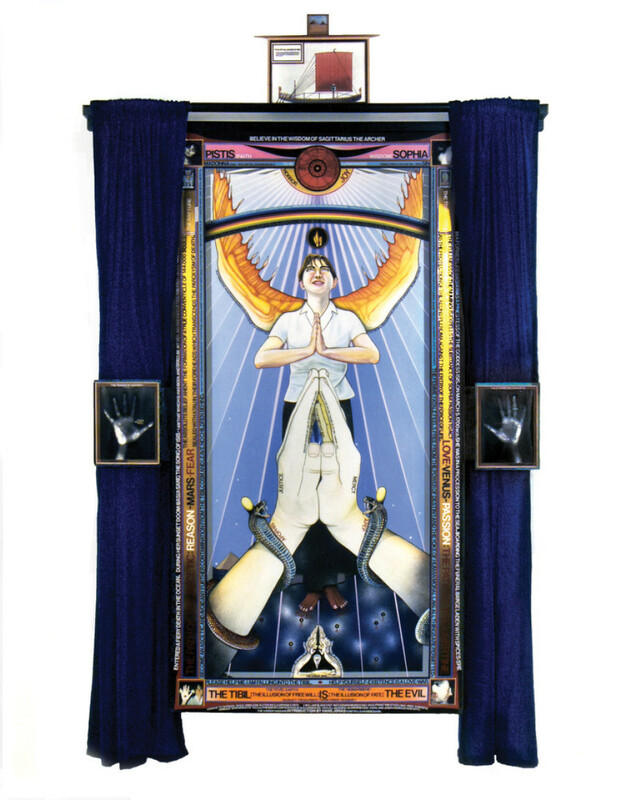 In 2001, Laffoley endured grave injuries after falling in his Boston studio, the one-bedroom apartment he'd been working in for over 30 years, dubbed the Boston Visionary Cell. In the hospital, he was forced to amputate one of his legs below the knee. Laffoley, however, made the best of a bad situation, requesting himself a prosthetic leg complete with a lion's paw, to fit his Leo horoscope. "The question is, ‘What is madness?’" Laffoley, who was diagnosed with mild Asperger’s Syndrome at a young age, asked Wonderland Magazine. "Think of what happened from the 16th to the 19th century, from the Renaissance to Freud. People’s ideas as to what constitutes being nuts keep changing. Maybe we’re just starting to wise up to that’s how the mind operates." Laffoley may be an outsider when it comes to the art world. He may be an outsider when compared, even, to other outsider artists. But the facts remain: his obsessive, visionary works attempt to unlock the greatest secrets of universal mankind -- from our cosmic origins to our essential philosophies. His work offers insight to us all -- all of whom, that is, have 15 hours to spare. Even if you don't take the time to fully comprehend every detail of Laffoley's vertiginous portfolio, we have to agree with Allison Meier when she said: "For even the most philosophically lazy among us it is a fascinating study on the use of visual art to express what is often beyond words." See Laffoley's work at the Kent Fine Art gallery at the Outsider Art Fair, from January 29 until February 1 at Center 548 in New York. Outside the Lines" is an ongoing series addressing the prickly genre sometimes referred to as outsider art.